There was frost on the windows when I woke up Tuesday, September 2nd. It was not yet dawn, 6:45 Utah time. I could hear birds chirping in the trees. Cows grazed in a neighboring field. Above, a squadron of geese flew in formation. That’s when I noticed a patch of snow on one of the nearby peaks, possibly Provo Peak. It was time to get moving. I found the showers, and had my first hot shower in over a week. That first hot shower after Burning Man is almost a religious experience. I changed into my cleanest dirty clothes, and decided to wear underwear. The first rays of daylight were poking over the mountains as I cleaned all the trash out of my car. Seagulls as big as chickens loitered around the marina. I hooked up the bike to the back of the van and headed out at 8:26. At a Walker’s convenience store down the road, I got gas, a Dr. Pepper and a hot dog for breakfast. I could’ve picked up a pail of nightcrawlers, too, had I been so inclined. I took I-15 south to Highway 6 and headed east towards Price. The Sun was already high in the sky. A half-dozen wind-powered generators stood guard at the edge of a steep, green valley. The road got tricky as it made its way through the mountains. I kept getting glimpses of beautiful mountainsides, but I dared not get out my camera. Scars and scratches along the guard rails told me what happened to folks who didn’t pay attention to the road. About an hour after leaving camp I topped the Soldier Summit, at 7,477 feet. The mountains seemed to smooth out a little on the downhill run, but that didn’t last. A sign warned of more dangerous curves for the next 10 miles, and they weren’t kidding. The road went into some dizzying twists and turns as magnificent cliffs rose above me. I was going through Price Canyon, and the views were magnificent… from what I could see through the dirty windows. By the time I got to Helper, Utah, I couldn’t stand it any more. I pulled off the highway and found a car wash for Satori. Puddles of beige water pooled under the car as I washed it off. Helper is an old mining town. There’s even a refurbished Muffler Man statue, made to look like a coal miner. The downtown was charming, except for the many “for sale” signs. The local dinosaur museum advertised “Stomp by for a visit.” I made it to Price just before 10:30. The landscape widened into lush green farms, but they soon passed behind me, leaving vast tracks of dry plains. A range of fierce peaks flanked the wide valley. It was another 60 miles to Green River. I listened to a CD of bagpipe music. I turned east on Interstate 70 and pulled off when I got to Green River (which looked kinda red to me). The city park was pretty. 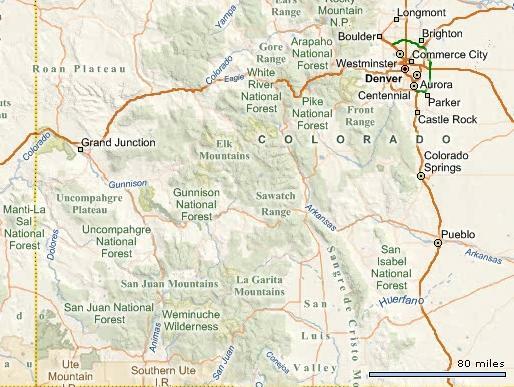 I got some gas ($4.09 a gallon) then continued on I-70 towards Grand Junction. I drove through some beautiful badlands as massive blue shapes loomed to the east. Two big crows rested on a speed limit sign. I found myself behind a truck marked Exodus Moving & Storage. A range of red and purple cliffs pointed the way to Colorado. I crossed the state line just before 2 PM. I could see lots of houses and green yards from the highway. Dalton Trumbo statue in Grand Junction When I got to Grand Junction, I pulled off the highway and followed the signs towards the downtown area. Downtown Grand Junction is completely charming: wide, friendly streets, interesting shops, big, shady trees, and art everywhere. There was literally art on every street corner. 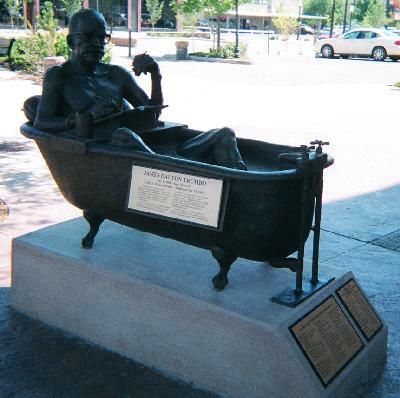 I had to laugh at the statue of Dalton Trumbo, sitting in a bathtub with a rubber ducky. Ever since leaving the playa, I’d been promising myself a steak dinner, and by God, I was gonna get one. I found a 50’s-era restaurant called the Main Street Café and had their “regular” steak dinner. (For the “large” dinner they just added a second steak.) It was pretty good. When I went to pay, however, I had something of a shock. It seems my wallet had less cash than I’d been presuming it had. A lot less. This changed things. My itinerary remained the same, except that with not so much cash that meant I’d have to start using the ATM card to get home. I’d really hoped I wouldn’t have to do that, trying to do the radical self-reliance thing, but at that point there wasn’t any choice. I got some gas ($3.89 a gallon) and hit the road. It was 69 degrees when I left town at 2:26 PM Mountain Time. Becka sent a text message that they ran out of gas, but were soon “rescued by AAA.” It was a beautiful day on the high plains. Fluffy white clouds danced across the horizon. I passed Rattlesnake Gulch with some purple mesas to the south. About a half hour later, I went through Delta, Colorado, which had a beautiful Egyptian-style movie theater. I listened to an oldies radio station. Going through Montrose, I had to hang a left down Main Street to follow Highway 50 east. Down the highway was Black Canyon National Park. I was sorely tempted, but it cost $15 to get in, and it was already mid-afternoon and I still had many miles to go… I had to let Black Canyon go. Two hours out of Grand Junction I topped Cerro Summit, elevation 7,950 feet, although it was not well marked. My mind wandered to the past week, and things that had bothered me, which just reminded me of other things that bothered me, and in no time at all I was in a sour, crummy mood. It was time for a pit stop. Ever since Burning Man, I’d been peeing like a race horse. 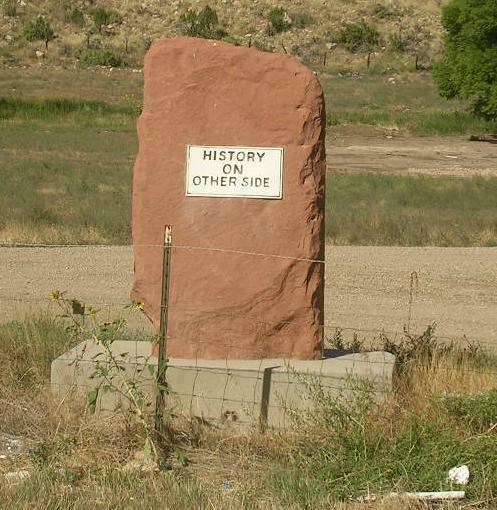 The next place down the road was Cimarron, Colorado. I stopped at a little general store called Newberry’s, which had wooden floors and lots of crystals for sale. I got a Dr. Pepper, some beer and sandwiches for supper, and hit the road again. Now that I had supper in the cooler, I made myself relax and enjoy the Rocky Mountains. The grade was steep and curvy going up to Blue Mesa Summit, elevation 8,704 feet. I passed rolling hills of freshly-cut grass, all baled-up and piled near the highway. At a cut up ahead, a sign warned of “falling rocks” –and they weren’t kidding. A westbound car had to swerve to miss the softball-sized rock in its lane. The road took me through a deep, shadowed valley, then back into the rolling hills. Blue water appeared ahead. As I came up to Sapinero, the road took me around what looked like a series of lakes. It was really one big one: the Blue Mesa Reservoir. I was in the Curecanti National Recreation Area, and it looked like a fun place to be. Lots of vacation houses clustered around the lake, which seemed to go on and on as the highway followed and criss-crossed it. The rich blue waters were hypnotic. Lush, wooded hills surrounded picnic areas. There were lots of RV parks along the way. 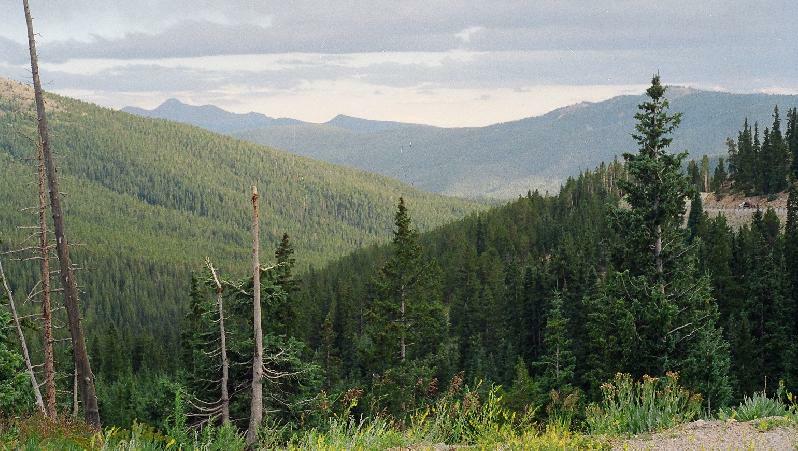 Near the Gunnison National Forest. People still find undiscovered Anasizi ruins in the Gunnison Forest. I got to Gunnison about 5:30 Colorado time. It was home of Western State College, and was the turn-off point for the Crested Butte area. My friend Sherry sent me a text message: “Are you humming Rocky Mountain High yet?” Outside of town, I found several cars following close behind me. I hate that. It’s like having someone read over your shoulder. They finally went about their business. By then, the clouds had turned grey as the Sun started to go down. I passed lots of farms: tiny, family farms nestled right up against corporate operations. About 30 miles out of Gunnison, I passed Dawson Creek! There really was one. I got to Sargents, Colorado right at 6 PM. I had another 125 miles to Pueblo. The road turned steep as I climbed towards Monarch Summit. The speed limits kept lowering: 40 MPH, 35 MPH, 30 MPH… Satori’s temperature gauge started climbing again. I thought I smelled burning oil. The road seemed way too narrow as it wound up the mountain. My ears kept popping. I tried to keep my eyes on the road. When I dared to take a split-second to glance out to the sides, the views were breathtaking. 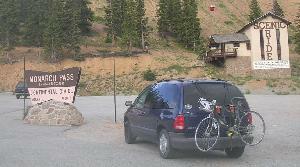 Satori’s engine was starting to complain, but then Monarch Pass emerged from the trees ahead. I stopped to take a picture at the Continental Divide. At 11,312 feet elevation, that was the highest I’d gone the whole trip. The visitor center was closed. A couple of semi trucks were parked there, resting up for the downgrade. On the downward side, I passed a truck pulling a huge turbine, struggling up the grade. The truck in front of me was only going 20 MPH, its brakes complaining loudly. About two miles down the mountain, I passed a runaway truck ramp off the side of the road. Dark skidmarks on the road indicated it was recently used. The light was fading as I entered the San Isabel National Forest. A sign told me I was near the headwaters of the Arkansas River. At a quarter to seven, I made it to Poncha Springs. I felt like I’d really accomplished something. The prices at the gas stations were noticeably lower. I passed a store called Leaf & Jug. Powerful crosswinds struck as I looked back at the imminent sunset. Brooding cliffs ignored me from above as the highway took me east into Bighorn Sheep Canyon. Even in the dim twilight, I could tell by the patterns in the cliffs that this was an area of high geologic disturbance. Several small tourist towns passed by: Coaldale, Cotopaxi, Texas Creek, with dark windows and empty parking lots. My eyes were starting to get bleary. 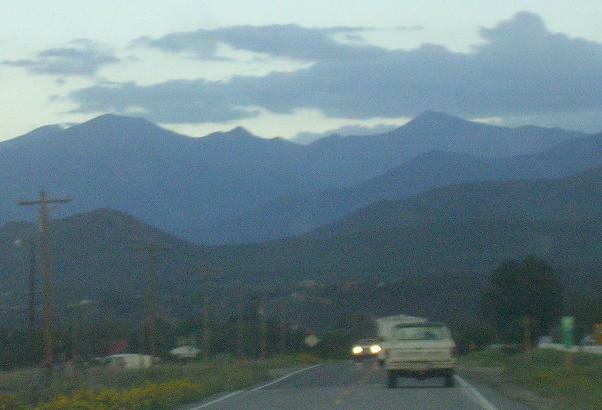 The Sawatch Range of Colorado contains eight of the twenty highest peaks in the Rocky Mountains. It was just before 8 when I got to Canon City. It was 62 degrees in town. The dinosaur museum was closed. A sign in the city park declared it was “our home.” It seemed to take forever to get through town, because of the zillions of stoplights, but once outside of town the road straightened out and I was able to speed up to 65. I really had to go to the bathroom. On the outskirts of Pueblo, I thought I saw a sign for the campground I’d planned on staying at, which was south of the highway, so I turned south. Following the road, it turned back west, the way I’d come. I got back on the highway and took the next road south, which also turned west. I stopped at a store for directions. The girl said to follow the road and turn left at Nichols. I followed the road, but there was no Nichols Road. At a different store, I asked where the state park was, and the counter girl said, “You mean the city park?” I was starting to get really frustrated. A customer finally gave me directions: go to the light, turn right, turn right, turn right, and then turn right. I finally found the park, paid my fee, almost drove into the water, and pulled into a campsite right at 9:30. I ate my sandwiches and drank my beer, but I was still too keyed-up to sleep. I found the bathrooms, which had coin-operated showers and a laundry. In the darkness, I could see quite a number of vehicles in the campsite, the fullest I’d stayed at. One of the campers had a tiny blinking red light; it was like I had a Cylon for a neighbor. Clouds seemed to be moving in. I thought I saw lightning in the distance. My friend Sherry sent a text: “Rest well, weary traveler.” Becka sent a text that they were still on the road in Wyoming; they were headed for Denver, and hoped to cross into Colorado about 1 AM. I figured I’d traveled 533 miles in 13 hours. I finally relaxed enough to fall asleep.